Offering you a complete choice of products which include ophthalmic drapes. We are reckoned amongst the remarkable manufacturers and suppliers in this domain, engaged in offering Ophthalmic Drapes that are used extensively for covering the body parts except the eye area during operation. 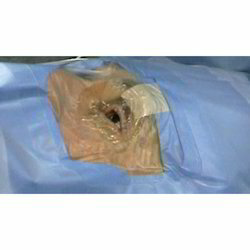 This ophthalmic drape is designed from the excellent quality material to offer complete protection during surgery and operation. Also, this ophthalmic drape is accessible in various specifications to choose from.